A survey has found that families going on holiday abroad can spend up to a tenth of their travel budget at the airport before they depart. Travel agency sunshine.co.uk looked at a typical family of four as a case in point. It said that on average it blows £116 of its £1,100 budget before boarding the plane. This is usually on items such as drinks, sweets, toiletries and meals, all of which can be purchased at the airport. The most popular item people like to buy from the departure airport, the travel agency found, was drinks to consume on the flight. The findings were based on the feedback from 1,783 UK adults who had been abroad in the past year. And they show that people often neglect the extra costs, such as travel insurance, associated with their holiday. 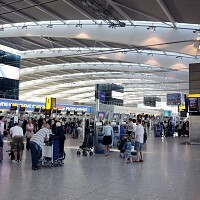 Sunshine.co.uk co-founder Chris Clarkson said: "To see that as much as 10% of the holiday spending money budget is blown in the airport before a family have even left the UK is a revelation indeed. "When booking a holiday and saving for spending money, people often forget about expenses incurred on things like transport to the airport, airport hotel stays and the money spent on a pre-flight meal, or getting some last-minute toiletries."